Walking with Jesus: Day 191: John 18:12-18 & Psalm 73 - How Does God Use Even His Enemies to Accomplish His Will? Day 191: John 18:12-18 & Psalm 73 - How Does God Use Even His Enemies to Accomplish His Will? How Does God Use Even His Enemies to Accomplish His Will? Caiaphas was the high priest, but he was not a good, God-honoring man. His family was very powerful and influential. His father-in-law, Annas, had been high priest, and though he had been removed from office, he still had great influence in Jerusalem. 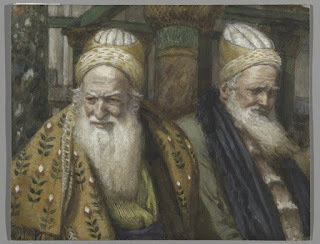 Annas' five sons and his son-in-law, Joseph Caiaphas, each served as high priest over Israel. Caiaphas wanted to protect his family's lucrative position. They accumulated great wealth and influence from the money-changing and animal-selling in the Temple. They saw Jesus as a threat. But Caiaphas was still the high priest, and as the high priest, he had a key role to play in Jesus' work on the cross. He had prophesied that it was better for one man to die for the people of God than for the whole people to be condemned. Now, he meant that it would be better to kill Jesus, even if it was an unjust death, in order ro keep the Romans from crushing the people in an attempted uprising. But God put the words in His mouth and God intended by them that Jesus would die for the sins of His people; He would be condemned that His people might be spared from God's judgment. Now, as high priest, Caiaphas was condemning the substitute sacrifice. Just as on the Day of Atonement, the high priest would lay his hands on the scapegoat and then sent it outside the camp to be condemned in the place of the people, Caiaphas laid hands (siezed) Jesus and condemned Him to die outside the city walls. Just as the high priest would offer up the nation's passover lamb, so He offers us Jesus to Pontius Pilate. Caiaphas wasn't the only enemy of God to be used for God's redeeming purposes. Caiaphas is serving in a similar role to that of Pharaoh of old, a corrupt leader used by God to deliver His people. Earlier in the history of God's people, He had used Joseph's brothers to sell him into slavery and set up the deliverance of God's people. God also used Judas in His redeeming plan. God can use anyone. God can out words in their mouths and lead them to act to carry our His purposes. He doesn't do so by overriding their wills and forcing them to do what they didn't want to do. Joseph's brothers, Pharaoh, Judas and Caiaphas all did exactly what they wanted to do, but each of them perfectly fulfilled the purposes of God for the good of His people. These powerful truths should give us great confidence. God uses all things for the salvation of His people and the glory of His name. No matter how evil, selfish, cruel or wicked people may be, they only end up doing what God has planned, for the redemption of His people. Praise God from whom all blessings flow, even blessings that flow to us through the hands of evil men!